Finally, a frozen pizza made the traditional way with pepperoni that has no nitrates and is BHA/BHT free. 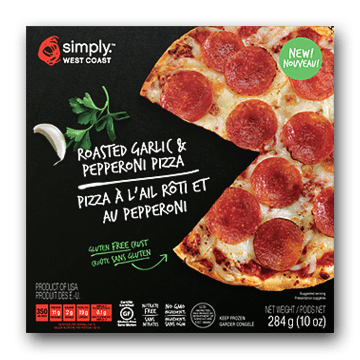 This delicious thin crust pizza is part of the Simply West Coast™ new line of natural, easy to prepare meals. 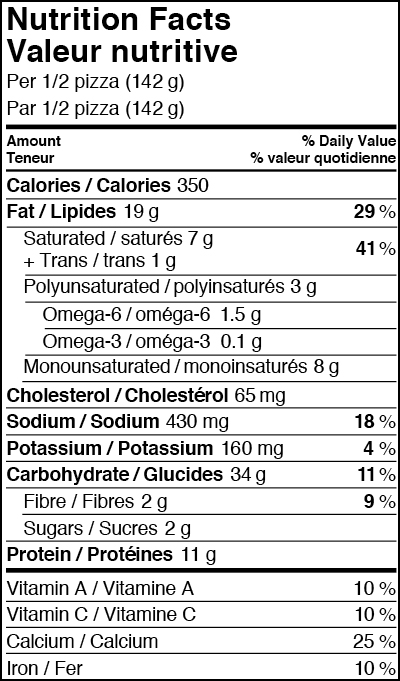 Gluten Free Crust (Rice Flour, Corn Starch, Liquid Whole Egg, Water, Non-GMO Canola Oil, Baking Powder, Sugar, Salt, Tapioca Dextrin, Yeast, Guar Gum, Xanthan Gum, Sodium Alginate), Mozzarella (Pasteurized Whole Milk, Bacterial Culture, Salt, Microbial Enzymes), Pizza Sauce (Vine-Ripened Tomatoes, Water, Roasted Chopped Garlic, Olive Oil, Oregano), Pepperoni (Pork, Beef, Salt, Water, Spice, Seasoning [Cane Sugar, Natural Flavouring], Seasoning [Extractives Of Paprika, Natural Spice Extractive], Lactic Acid Starter Culture), Roasted Garlic Spread (Garlic, Olive Oil), Romano Cheese (Pasteurized Sheep’s Milk, Bacterial Culture, Rennet, Salt).